Soooo….if you haven’t noticed yet, I’m BIG into reflecting. As I said in one of my first posts, I wasn’t always like this, mostly because I was under the false impression that there was just “never enough time” to do something and then spend more time reflecting on it. Yes, “reflect” is a verb, it inherently involves an action, but too often “reflecting” is depicted as something that has to be done alone–perhaps curled up at one end of your couch, your chin nestled in the crook of one arm, while the other hand holds a steaming cup of tea that you don’t even want; or perhaps you think you should be sitting on a window sill, watching pregnant raindrops slowly crawl down the panes of glass as you gaze out onto the bustling street below…feeling so small and melancholy while the rest of the world continues on with the day…*sigh*…it’s what we’ve seen in the movies, right? That’s how we’re supposed to do this whole “reflecting” thing? Totally. Well to that, I say, NO! If there is one thing that I’ve learned in the past few years, from my first mentor Renee Hobbs, and more recently from the faculty and fellow graduate students that I have been so lucky to work with at Teachers College, it is that reflection is one of the most stimulating, active and inspiring processes I have ever engaged in. Of course, I am romanticizing this a bit–reflection can also be uncomfortable, frustrating, and wrought with tensions–but I am doing so for the sake of making a point: we should all engage in honest, authentic, and productive reflection more often. It is so important for us to share our ideas, feelings, observations, and discoveries with one another, especially when they are some of the ideas from people that are going to change the world…or who at least are impacting our individual [and collective] lives; what Lesley Bartlett (2007) calls figured worlds, “cultural realms of interpretation,” where significance is assigned to characteristics and actions based on our individual lived experiences. To not share these ideas and people with one another would be a disservice to everyone. Yes, we could (and do) spend ample time talking about the negative effects of our hyper-connectedness–how we are losing our grip on social graces, face-to-face interactions, our inherent humanness; but every time I am a part of or observe a conversation like this, I think of the incredible people and things that I have discovered in the last six months through social media alone. I’ve been lucky enough to see many family members and friends over the holidays and the second question after “How are you?” has been, “How’s school? !” While I tend to talk and write in a more long-winded fashion than I would like to (I’m working on it, New Years resolution, I promise), I found myself to be a woman of substantially fewer words in the week after handing in my last final on December 23rd. All I able to get out was “It was awesome! Really good, really busy. But yea, great.” Ugh! That didn’t do it justice at all! While I’m mostly chalking my mundane responses up to general end-of-semester-burn-out (and I know there will be plenty more semesters and “How’s school?” opportunities for me to better express myself, it was frustrating because there was so much more that I wanted to say about the amazing fall semester I’d had. I attended this conference, co-hosted by Urban Word NYC, for the first time last September. The experiences that I had at this conference (over the course of less than 24 hours), set unexpected wheels in motion for the entire semester. It’s still difficult for me to put into words what exactly transpired in my mind and body during and after the conference, but I still get emotional (in a good way) when I think about the workshops I attended, the conversations I had, and the people I met (many are listed below). This conference is mostly about hip hop education (the theory of teaching) and hip hop pedagogy (the method and practice of teaching), but it was different from any other conference I’ve attended for two reasons: the first was that the sessions were all held in a more collaborative, workshop format, rather than a presentation format, requiring participants to actively engage and see how one might bring the tentets of hip hop pedagogy and education into the classroom. The second distinct characteristic of this conference is that it was not solely populated by people in academia. There were hip hop and spoken word artists, consultants, musicians, teachers, and advocates in attendance. I think the latter feature was what really got me down in my core. Throughout the day, there was an energy reverberating throughout the hallways, up and down the stairwells, and in the workshop spaces–although the participants came from different cities, different countries, different professions, we were all there for the same reasons: we want to be a part of fundamentally changing education and we believe that hip-hop education holds great promise in better engaging students. I was so moved by the work and the words that day and I encourage anyone interested in this kind of work to attend the 2013 conference. I can’t say enough about this group and the work they’re doing. Co-founded by a friend/sister/colleague, Nuala Cabral, this organization is doing groundbreaking work in the field of media literacy. They’ve recently gotten a lot of attention for their talk back about 2 Chainz “Birthday Song” (video above) as well as For Corporations, When Colored Girls Are Degraded: An Open Letter to CEO Lucien Grainge of Universal Music Group. Women of color are acutely aware that we are often missing or stereotyped and degraded in mainstream media. The FAAN Mail Project stems from this awareness and the desire to respond. 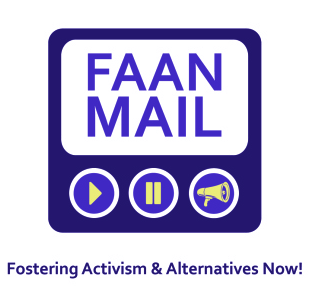 FAAN Mail (Fostering Activism and Alternatives Now!) is a media literacy and activism project formed by young women of color in Philadelphia. Together with our allies, we seek to critique and create media, so that more diverse, fair and fully human representations of who are exist. Through the process of “talking back” (bell hooks) to media and creating new alternatives with each other and teen girls, we deconstruct and challenge hegemonic representations and messages within media and our everyday lives. Media Make Change is a socially responsible for-profit organization based in New York City. The organization’s mission is to help support and build dynamic partnerships with social leaders, informants, activists, and entrepreneurs committed to making a positive impact around the world and using digital media technology as innovative and creative tools for civic engagement and community building. This organization was founded by my friend/colleague/schoolmate, Tara L. Conley. She’s a third year doctoral student in my program at Teachers College. I met her on my second day at TC and she has been an amazing source of information, insight, and inspiration for me over the last year and a half. She is scary smart and is doing (and will continue to do) groundbreaking work, I have no doubt. Dr. Vasudevan is my advisor and amazing mentor at Teachers College. Her research focuses on adolescent identity(ies), multimodality, media and digital literacy, and youth culture and education. She teaches the Culture, Media & Education course that I just completed (see previous blog posts, “Where I’m From” and “Let Me Pump Ya Brakes”), and it was one of the best classes I’ve taken in both my graduate and undergraduate careers. She is encouraging, supportive, so incredibly knowledgable, and constantly pushes me to new intellectual and practical boundaries. I’m so excited to be working with her and the 3MM team. Just last week we had our Winter Social Issues Media Festival online, how cool?! I also met Caroline at the Preemptive Ed Conference (I’m telling you, this conference changed everything this semester in such an amazing way). We were partners in a social/racial identity workshop and hit it off immediately. She is a spoken word artist, a writer, and an eating disorder recovery activist. In 2008, Caroline created a video series on YouTube called Body Empowerment meant to expand conversations about eating disorder recovery and positive body image. Above is a video of her performing her poem “Fat,” (which Lady GaGa retweeted a few months ago after the media trashed her for gaining 25 pounds while on tour…needless to say, this girl’s legit). Seriously, she is incredibly talented and performs in NYC often, check out her website, go see her performances, and watch her videos ASAP! *Sound quality isn’t great, but listen to what Sam is saying about the mission of the organization! I found out about this great up-and-coming organization at the Preemptive Ed Conference as well. Co-founded by a few graduates of UMass Amherst, this group is using sneaker culture to work with urban youth to better engage them in the classroom and help them to succeed academically in subject areas that students of color are not often encouraged to enter into. S4S uses sneaker culture, urban lifestyle, and footwear design as a platform so students can discover their intuitive creative powers in solving problems. Our program, delivered through a 12 week curriculum, takes students through the process of how a sneaker is made emphasizing design, STEM (science, technology, engineering, math) fields, and marketing/communication. Sneakers are an element of our youth’s lifestyles–sports, music, fashion, art, etc. Throughout the 12 weeks, we will examine sneaker culture and the footwear industry from many different perspectives including, but not limited to, the historical and social influences of sneakers, powerful marketing campaigns, footwear design and production, and the engineering and science behind creating sneakers. The use of sneakers keeps the students engaged and connected to the standard school material as well as exposing them to ways they can transform their passion into anything. Overall, S4S will given every student the “sole power” needed to achieve anything. This list is by no means exhaustive, but for the sake of my readers and my fingers, I’m going to stop here. I hope I’ve been able to effectively communicate not only how wonderful and challenging and exciting my semester was, but also how unbelievably blessed I am to have found these people and to be a part of these organizations and these conversations. Can’t wait to see what’s up next! And with that, I wish everyone a very happy, healthy, and actively engaged new year! Let’s make 2013 epic. Cheers!